The Scrapbooking Queen is hosting a blog hop from December 2nd to December 4th pst! Come on in and sing with us! 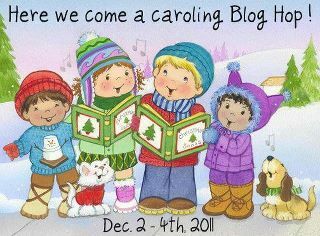 It is the time of year to go caroling! We all created a card(s) using a wonderful Christmas carol as inspiration. We also added the music that inspired the card we made! You might find some prizes along the way. I am giving away some candy to one lucky commenter on my post. To win the candy just become a follower and comment on this post! I will announce the winner on December 5th. So make sure to stop back then! 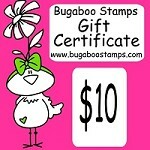 The candy I am giving away is digital images from Bugaboo!!! My song for this caroling blog hop is Frosty the Snowman! I used a wonderful image from Meljen's Designs called "Caroling Snowmen". This card won TOP 5 over at Meljen's Designs! Here is the winning post! Gorgeous card Dawn,I love their blue hats and scarves and great choice of song. Thank you for joining us for our ANYTHING GOES week at Willow Sketchie. super cute!! i love the snowmen!! So cute. Singing snowmen are adoreable. I am honoured to be in this hop with you. Hugs!!! Beautiful card! Love the snowflakes! this is fantastic Dawn, love the special little touches you've added! So fun! Such a clean, bright card - too cure! I love the liquid applique. I have always heated it up but love the effect when you don't - I'll have to try it! Thanks for playing at Stamptacular Sunday this week! Adorable card with a cute image!! Thanks for playing with us at The Paper Shelter. Cute card, I love the snowmen. Gorgeous card! I have this image too .. they are just so cute! Makes you want to sing. I love this image! It was just perfect for your post today:) Perfect card! What a great digi! And such fabulous coloring. A lady after my heart. I LOVE SNOWMEN and cannot collect enough of them. Thanks for the hop and for sharing. Just love snowmen cards, this is adorable!! Cute project, thanks for sharing. your card is so cute, i love snowmen i think they are so cute and this image is adorable. Cute card and all the caroling is so much fun. Thanks. Please let Rosy know their is a problem with the comment area of her blog and couldn't post to be eligible for her giveaway. Your card is fabulous!!! My compliments. Thank you for joining us at Meljen's this week and thanks for using our image. A lovely cute card, Dawn. Thanks for joining us at Rainbow Lady. A great card, thanks for joining in at Willow Sketchie this week, I do hope you will join us again. Wow!!! Your card is just so cute. Thank you very much for joining us at Willow Sketchie Challenge this week and the best of luck. Wow Dawn, your card is absolutely adorable!! I just love your little snowmen.. It was so nice being in this hop with you..
Super cards. Thank you for sharing with us at Rainbow Lady's this week.